Soft Baked Chocolate Vegan Donuts Recipe (Gluten Free) – with Vegan Chocolate Ganache Glaze! This soft and fluffy vegan baked donut recipe is topped with luxurious vegan chocolate glaze. It’s the best vegan gluten free chocolate donuts – easy, healthy and decadent! Did I say it’d be raining chocolate in February or what? Okay, that visual is just too much to handle. I’m basically Homer in the Land of Chocolate. It’s straight up raining vegan Whoppers into my mouth right now. Lol. 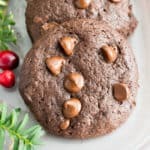 But since vegan Whoppers probably take way too long to make, why don’t we turn that no-chocolate frown upside down (whaaaaa) and make some soft baked chocolate vegan donuts?!? Yeah!!! 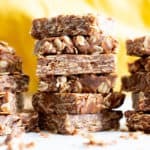 And if you’re still super intent on making some kind of chocolate-fantasty-worthy vegan chocolate candy, try this 3 ingredient homemade crunch bar recipe and this 3 ingredient chocolate almond bark! Btw, I soooo meant to type “fantasty.” ???? 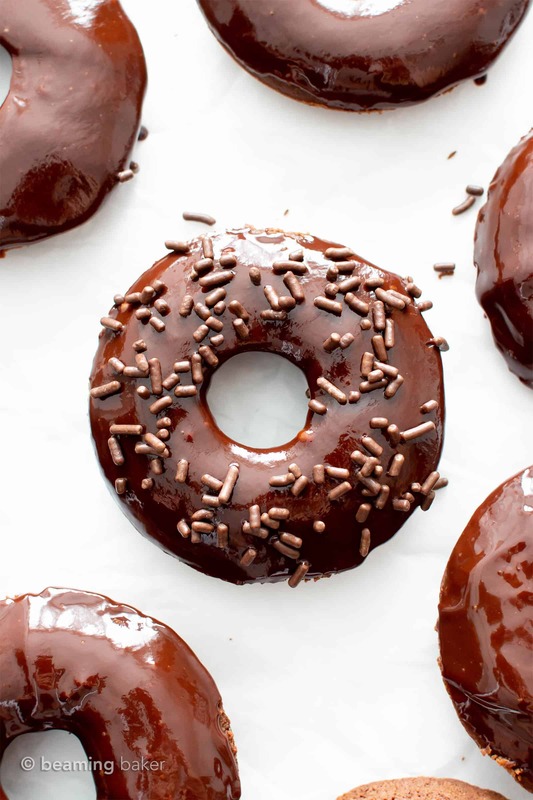 This Soft Baked Chocolate Vegan Donuts Recipe yields super soft donuts with a decadent and luxurious vegan chocolate glaze that even Homer couldn’t resist. Okay, that’s just crazy talk since we already won him over at Soft Baked. Heehee. Without further ado, let’s chat about all things Vegan Baked Donuts! Make that Vegan Gluten Free Chocolate Donuts! In today’s post, I’m gonna go over the tips & tricks for perfect vegan chocolate donuts, as well as common questions and the tools I use to make these gluten free donuts perfection. Let’s do it! Is this Vegan Baked Donut Recipe Gluten-Free, Dairy-Free, Refined Sugar-Free? Healthy? Yes! To all of it! 😉 This is my favorite recipe for soft chocolate donuts that just so happens to be gluten-free, vegan, refined sugar-free and healthy. Just don’t eat all of the donuts at once. Unless you want to. You soooo want to. Start with an amazing donut pan – this one is super durable and yields perfectly-sized chocolate donuts. I’ve tested both greasing the pan & not greasing it with similar amazing results! Tips on Homemade Oat Flour: make sure to use very finely ground gluten free oat flour without any major chunks of oats in it. Remember: the oat flour needs to be very fine, just like regular flour. 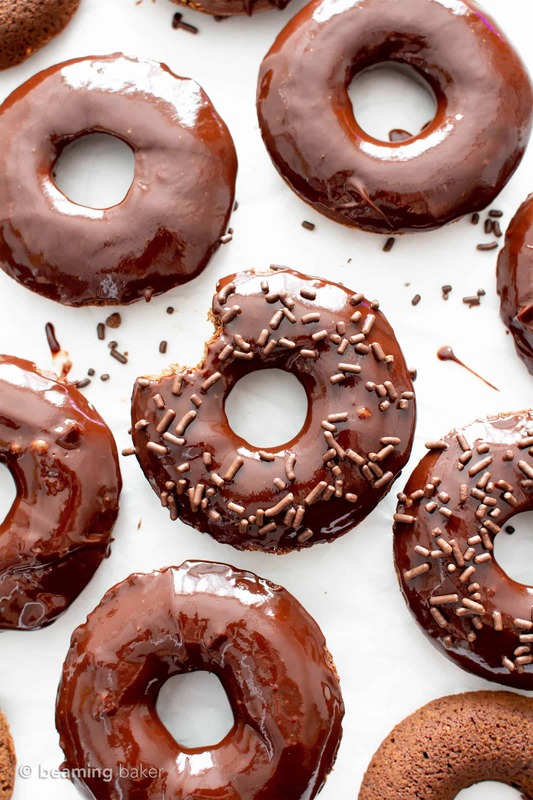 How do I make the Vegan Chocolate Glaze for this Vegan Gluten Free Donuts Recipe? 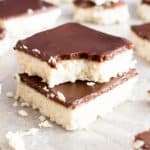 All you need are 2 ingredients: coconut cream and chocolate. Check out easy instructions here → Chocolate Ganache Recipe. If you’re feeling a bit extra, I highly recommend topping these soft baked vegan donuts with this super easy homemade chocolate frosting. It’s unbelievably silky, creamy, indulgent and just… chocolate bliss. Bonus: it’s paleo, vegan, gluten-free and dairy-free. Yaaaaas!! 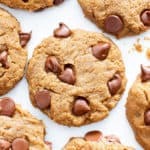 Can I swap the oat flour for another flour? Yes and no. The best, closest results will likely come from using gluten free all purpose flour. Each brand works differently, so results will vary. 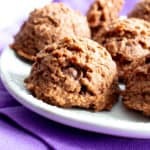 Do not swap the oat flour for almond flour and/or coconut flour in this chocolate vegan donuts recipe. Those two flours will yield highly unpleasant results. Can I swap the coconut oil for another oil or butter? Yes, with varying flavor & texture results. Some oils, like olive oil, are highly fragrant and will make the donuts taste like olive oil! Lol. Flavorless oils are best. Melted vegan butter will most likely be the best sub. Can I swap the coconut sugar for another sugar? Just make sure you use another similar dry, granulated sugar, such as organic cane sugar. Do not replace with a liquid sweetener. Can I swap the maple syrup for honey, agave, monkfruit sweetener, etc.? Yes, again with varying results. Each liquid sweetener has its own personality and profile, so it’ll react differently in the recipe, and have varying levels of sweetness. Try it out and learn/experiment as you go. And comment below to let me know! How do I store these Easy & Healthy Vegan Baked Donuts? Store these healthy vegan baked donuts in an airtight container at room temperature, out of direct sunlight/near heat sources. You can store them in the refrigerator, but doing so will result in condensation on the tops of the chocolate donuts. To quickly firm up the soft vegan donuts, you may chill for 30 minutes in the fridge before enjoying. 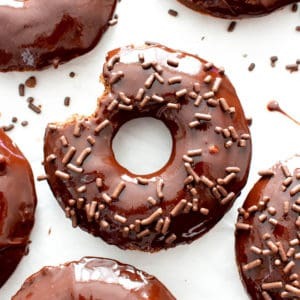 Soft Baked Chocolate Vegan Donuts Recipe (V, GF): this soft and fluffy vegan baked donut recipe is topped with luxurious vegan chocolate glaze. It’s the best vegan gluten free chocolate donuts – easy, healthy and decadent! Preheat the oven to 350°F. Coat two 6-donut pans with nonstick spray or coconut oil. If using a non-stick donut pan with the non-stick coating intact (fairly new), do not spray. Set aside. Make the donuts: In a large bowl, sift together the dry ingredients: oat flour, cocoa powder, baking soda and salt. Set aside. Pour or spoon batter evenly into prepared donut pans. Tap the pans several times to even out the batter and release bubbles that have formed in the batter. Bake for 10-14 minutes. Mine took 12 minutes. Test for doneness with a toothpick—it should come out clean when done. Place pans on a cooling rack to cool for 10-15 minutes. Bang the pan vigorously on a flat surface covered with a towel (to protect the surface) to loosen donuts—you’ll see a donut or two jump up when they’re loose. Flip pan upside down onto the cooling rack to remove donuts. If necessary, bang the pan again to loosen leftover donuts. Allow to cool until completely cool. Make the Chocolate Ganache: follow recipe to make Chocolate Ganache here. 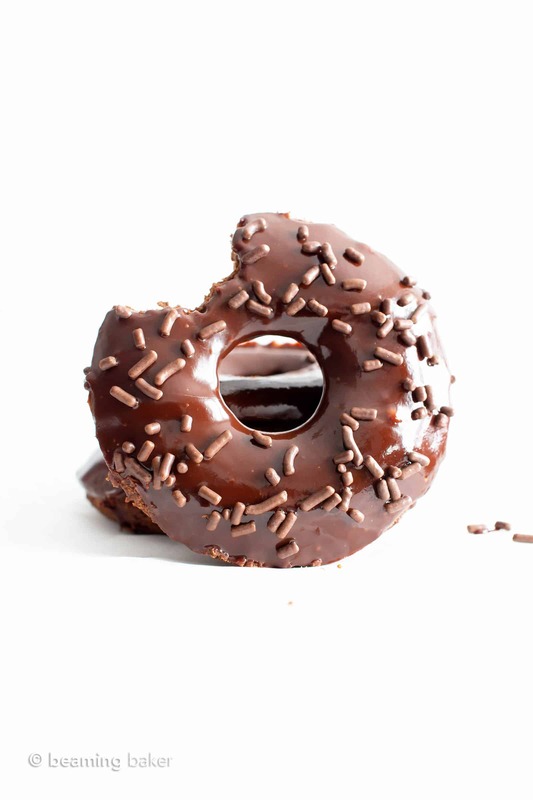 Gently dip one cooled donut into the ganache, with the smooth, baked surface covered in ganache. Donuts are soft and require care in dipping. Place donut back onto the cooling rack while assembling the rest. Optionally, top with chocolate sprinkles. Repeat for all donuts. Enjoy! Storing instructions below. Also try my Vegan Chocolate Cake and my Dark Chocolate Muffins. - Storage notes: Best stored in an airtight container at room temperature, in a cool, dark environment (out of the sun) for 4-6 days. - Day 2: donuts are firmer and flavor intensifies to a rich, deeper chocolate flavor. So good! - For firmer donuts quickly, chill in the refrigerator for 30 minutes max, then enjoy or continue to store at room temperature. Storing in the refrigerator overnight is not recommended—ganache on donuts will become too moist & develop moisture beads. Donut Pan – I can’t say enough great things about this donut pan! It’s amazingly nonstick, sturdy as heck and yields the perfect sized donuts. Gluten Free Oat Flour – a quick alternative to making your own. Coconut Oil – great quality at a great price. 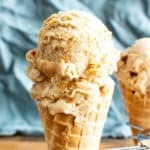 Coconut Sugar – super consistent, yummy flavor. One of my healthy vegan baking essentials. Cooling Rack – my go-to cooling racks to chill all of my baked goods. Previous Post: « 5 Ingredient Raw Vegan Brownies (No Bake) – Best Healthy Raw Brownies Recipe! Haha I’m the same way! ???? I know you’re definitely gonna love these donuts! I am SO excited to make these for Valentine’s Day! My last experience making vegan gluten-free donuts was not the best but I KNOW you have knocked this out of the park! 🙂 Thank you for all that you do! YEAH!!! ???? Stacey, I absolutely cannot wait to hear what you think! Thank you for your faith in my baking skills—they have my blushing! 😉 Thank YOU for taking the time to leave such a sweet comment. Hugs! ???? Chocolate on chocolate, it doesn’t get better than that! I love this recipe! LOL I couldn’t agree more! ???? Thanks Tayler! These donuts look amazing. 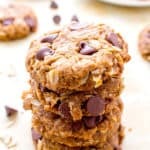 Brilliant idea to use oat flour, and the non-dairy milk products. I’ve often said you don’t need to miss out just because of your diet choice. Great recipe. Thanks Helen! 🙂 Oat flour is one of my very favorite flours to use in V+GF baking. You’re so right!! I didn’t know, that wholesome donuts can look so decadent and seducing at the same time. 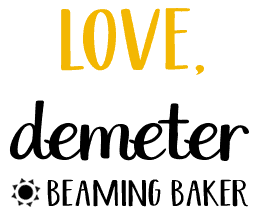 I love also your shining chocolate ganache, Demeter. Can’t wait to try it soon and surprise my vegan daughter. Was looking for vegan donuts! This recipe is great! Yeah!!! I’m so glad that you enjoyed them!!! 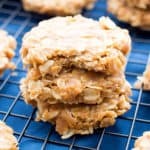 Guilt-free treats: I absolutely AGREE! ???? This was my son’s first donut so thank you so much for sharing this easy recipe. Will be making these again! Wow!!! That’s amazing! I’m beyond pleased that you both enjoyed it. ❤️ Happy baking, Mahy! These are amazing!!! Super simple to make and I gave them to my parents and their friends and they all raved about them! Thanks for this recipe, can’t wait to make these again! Thanks so much, Chrissie!! It’s so wonderful to hear that you and your loved ones enjoyed them. ☺️☺️ I’m Beaming, can you tell? ???? Big hugs!! ???????? 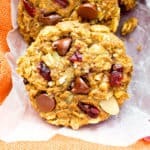 instead of oat flour can almond flour be used?? All the taste and none of the guilt! Love this !! Oh YEAH!! Couldn’t have put it better. Thanks Amanda! These vegan donuts are exactly what we need for breakfast! They look amazing! What a FUN breakfast!!! ???? Thanks Catalina! Looks divine! I’m sure this will quickly disappear on the table, adding to my list of must makes! Thanks Melanie! Absolutely. 🙂 Hope you enjoy! Ok WOW these look amazing. That beautiful ganache shine though!! 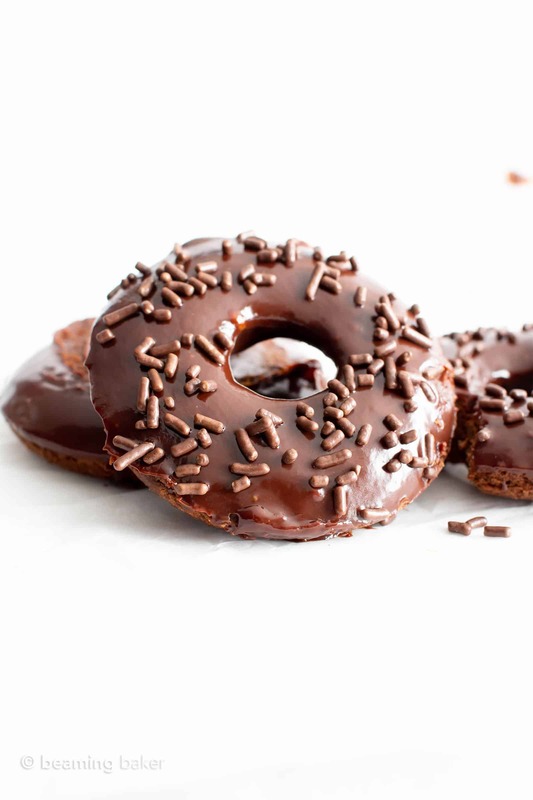 Love a lightened up donut recipe and you can never go wrong with chocolate! Thanks Ashlyn! The ganache is so much fun to make & yummy! Enjoy. Hi, in an apparent moment of Maire Kondo-ing a few years ago, I gave away my donut pan. Can I make these as muffins instead? They look amazing! 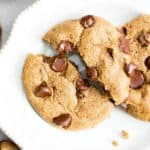 Do you have to use GF oat flour, or can you use regular oat flour. Hi Susan! You can definitely use non-GF oat flour in this. Hope you enjoy! I love everything about these! Gonna try to make these next weekend with my girls! Woohoo! Hope you all love them Jessica! ???? Haven’t made yet…but surprisingly NO baking powder? Hi Lil! Nope, just baking soda. 🙂 Happy baking! These look so delicious 😋! I need to make these for my kids👍. These were amazing… cant thank you enough for this recipe. Every one loved it. Do you think I can make a non chocolate version just by omitting the cocoa? I would love to have different varieties of it.